A Rich Assortment of Chocolate Desserts! A perfect gift for the chocolate lover in your life, Pemberton's Chocolate Lovers' Dessert Assortment is loaded with chocolate temptations. A beautiful bottle of fine wine is the centerpiece for this enchanting Tray for Two gift basket. Brimming with imported and domestic cheeses, Pemberton's homemade jelly, unique crackers, fine candy and more! Sweet and savory snacks will delight you! This tower of three elegant boxes brimming with a mix of savory treats includes Vermont cheddar cheese and Fastachi's cranberry nut mix. On the sweeter side this gift includes delectable Leonides Chocolates, a collection of imported cookies and more. Delicious dessert assortment packed in three elegant boxes! A delicious array of baked goods, cinnamon coffee cake, cookies and brownies. Serve it to your guests or indulge on your own. This basket is the star of the show with fine wine, chocolates and more! 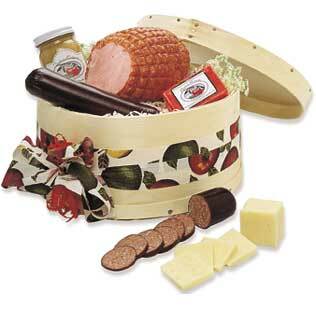 A large and beautiful basket is overflowing with goodies that will make a lasting impression. Send this gift for any special occasion. Happy New Year! Want to send a New Year gift to friends and family? Use the Promo code 2019 and save 10% on your order. Please call us at 1-800-551-7327 with questions about transit time, to make special delivery arrangements or for custom orders. Gifts ordered by 2pm EST ship that day. Orders received after 2 pm EST will ship the next business day. Orders placed on Saturday and Sunday will ship on Monday. Unfortunately, due to state regulations, we can not ship gifts containing wine to Maryland, Kentucky, or Utah. 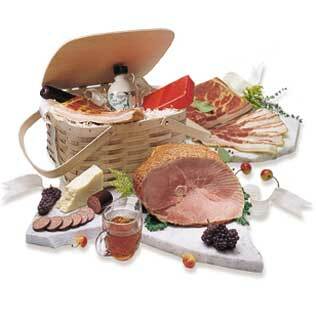 Please see our selection of Gourmet Baskets for some alternative gift ideas. My boss sent us a baby bassinet from Pemberton Farms when our son was born and it was so adorable! Thanks.